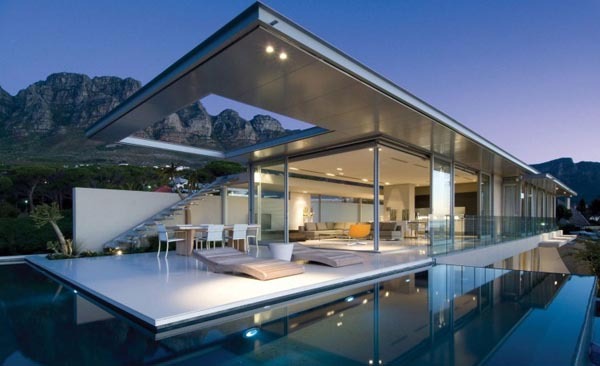 Designed by the likes of Stefan Antoni Olmesdahl Truen Architects (SAOTA), the First Crescent Villa is an architectural masterpiece located in the luxurious surroundings of Campus Bay, South Africa. The interior of this rental building features a wonderful open space with a simple yet tasteful design, which is enhanced through careful selection of building materials. The architecture is notable for its use of cantilevers, linear arrangement and limited palette of materials. A large outdoor skylight connects the building to the surrounding landscape. Huge windows allow both light to come in and residents to peer out to appreciate the natural view. The contemporary interior is just as impressive as the facade, yet the living spaces where designed to have great connection to outdoors via terraces.